This walk: 2011-2-16. Dartmeet road bridge, clapper bridge, River Dart confluence of East & West Dart Rivers, turkey, canoe access point, Combestone Tor, gorse, Week Ford, stepping stones, St. Raphael's Church, foxglove plant, snowdrops, mementoes of the old school. Photography credit: "Photos by Jim"
This clapper bridge would have been more impressive than the one at Postbridge; this one is bigger, with5 Imposts compared to Postbridge’s 3, and higher as the East Dart is bigger here. It was washed away 1826, re-built 1888 by Dartmoor Preservation Association, washed out again; 1993 “repaired” and made safe by Dartmoor National Park Authority after further flood damage. Nearby is “Badger’s Holt”, formerly two cottages, one inhabited by George Caunter and the other by Joe and Daniel Leaman; both became a fishing lodge, and later the summer residence of a Mr Rose, know locally as “The Badger". Pronounced feather and tare marks in a piece of granite. Apparently chain-sawed logs, reminding that Keith was on a chainsaw training course! Outline of a tree that bore a lot of lichens. The River Dart - the confluence of the East Dart and the West Dart. A turkey! This almost begs a caption competition - but there is one later! The confluence of the two Darts again. Not sure what this is??? Combestone Tor, at SX 670 718, elevation 356 metres (1167 feet). "The gorse flower is not misssing - so there can be more kissing" - my version of the old saying! An artistic impression of old tree branch, ivy and moss. Week Ford stepping stones ..... re-aligned 10 years ago, with two tin mills ("Blowing houses") on opposite bank. Jess, defying gravity and other rules! This is where we were! Moira, Rosine, Viv & Liz. Isobel, Anne, Hugh, Sue, Tim, Jan, Kay (partly hidden), Suzi & Christine. Lichen, Usnea (species not known). Snowdrops Galanthus nivalis = snowy milk blossom (because each flower is thought to resemble a droplet of milk), also called “Fair-maids-in-February” or ‘Candlemas Bells (named after Candlemas, 2nd February). Mementoes of the old school, again. 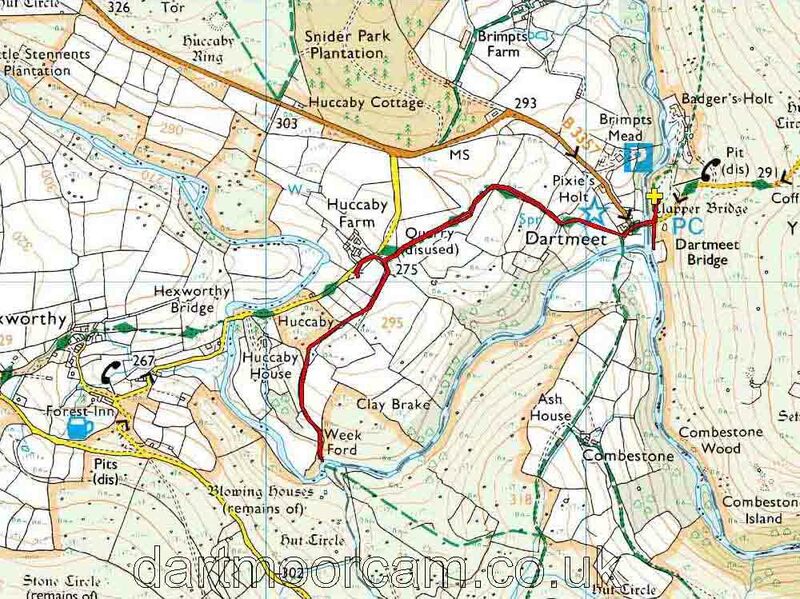 This walk was accessed very easily, using the main car park by Dartmeet Bridge, parked by the yellow cross and the P symbol on the map. This lays on the Two Bridges to Ashburton road.